Charming old house with former walnut mill, in a lovely rural setting. Requires modernisation. Barn and 2 acres of land, with mill stream. This former mill is a fantastic opportunity to create a lovely house in a peaceful setting. . . .
Beautiful fenced plot (3,5 acres) with a fishing lake of 2,8 acres, 10mn from Barbezieux ST Hilaire. Nice plot of land with lake for any fishing activities (only 8mn from the N10). One of 2 adjacent building plots on the edge of the pretty town of Baignes. Services nearby. Building plot (1348m2), with services adjacent, on the outskirts of this small market town, . . . Located in a quiet area, 2 minutes from a bakery, this charentaise house offers peace and . . .
Great renovation project! Unusual large house with 2 little lakes and 12 acres of grounds, in a lovely rural location. Large property to renovate with potential to create a stylish home in beautiful wooded . . . 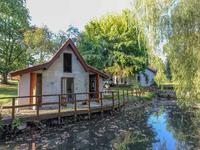 Situated in a hamlet 40 km from Cognac and Angouleme and 80 km north of Bordeaux, close to . . .
Great plot with electricity, water and access road, in a peaceful location close to Baignes . . . Attractive bright and spacious traditional town house with 2 large reception rooms, kitchen, . . .
Well renovated large detached house with 4 bedrooms set in beautiful gardens with country . . . This is a fantastic opportunity to purchase a house ready for renovation. It is a deceptively . . .
Building plot (1755m2), with services adjacent, on the outskirts of this small market town, . . . The historic site was refurbished in 1999. It consists of a large tiled building . . .